As with the travel ban, Trump is taking an action that would have been unimaginable by any other modern president. It is (or rather was) a bipartisan norm to allow former high-ranking officials to keep their clearances. That doesn’t mean ex-officials are being regularly briefed on classified material. They’re out of the loop. Rather, they retain their clearances so they can be informed of classified information should it be necessary or helpful to the government. For example, a president might want to get former officials’ advice about an ongoing challenge in foreign policy or intelligence. Or current leaders might want to ask their predecessors about some issue on which their past knowledge is essential. All that is much easier if the officials remain cleared. The practice also helps with government continuity. Past officials might later return to their agencies, and it will save time and effort if they don’t need to be recleared. They can walk into their jobs ready on Day One. Trump is painfully flouting the forward-looking interests associated with this norm. As with the travel ban, Trump’s action this time is rather obviously motivated by an illegitimate purpose: punishing a retired public official for the exercise of free speech. 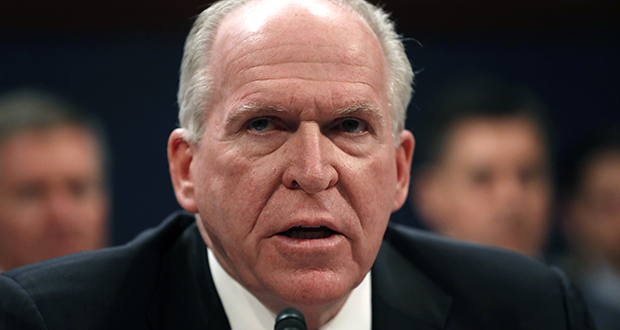 Brennan — and the other Barack Obama administration officials whom Trump is considering banning — have done nothing whatsoever to merit having their clearances pulled. But they and Brennan have been criticizing the president. It’s preposterous to think that criticizing Trump makes Brennan somehow “erratic” as Trump has suggested. Everyone knows that Trump is targeting him on the basis of his views. Pulling Brennan’s clearance violates the spirit, and conceivably the letter, of the First Amendment. It abridges the freedom of speech to change an official’s clearance status based on the content of his expressed beliefs. In the same way, the travel ban violated the basic notion that the government must not discriminate on the basis of religion. And in the case of Brennan, as with the travel ban, Trump knows or has been advised that the courts will let him get away with flouting constitutional values because his action is nominally at the core of his presidential power. In Trump v. Hawaii, Chief Justice John Roberts’s opinion emphasized that making immigration decisions pursuant to congressional authorization was “within the core of executive responsibility.” He used that characterization as an excuse not to delve into Trump’s true motives, instead insisting that it mattered that the travel ban was “neutral” on its face. Security clearance is another area where the Supreme Court has long considered the president’s power to be a reason for judges not to review executive decisions. In the most prominent case, Department of the Navy v. Egan, the court essentially said that because the president is commander in chief, he has the discretion to rule on security clearances — and the courts shouldn’t second-guess the substance of his determinations. The legal issues regarding Brennan are more complicated than that, to be sure. A good explanation of the possibility of reviewing the president’s procedures (not the substance) of revoking clearance can be read here. And it has also been argued that the courts might conceivably not want to allow the president to blatantly target free speech by pulling clearances. But technicalities aside, the bottom line is that the Supreme Court could very easily hold — and almost certainly would hold if asked — that Trump’s decision is essentially unreviewable provided he gave a decision for his action that was neutral on its face. The precedent for that holding would be, you guessed it, Trump v. Hawaii, where Trump also gave a veneer of neutrality to the ban in its third iteration. Here, the veneer of neutrality is that Trump can say that Brennan was showing “erratic conduct and behavior.” It’s absurd, to be sure. But here’s the thing: So was Trump’s claim that the travel ban wasn’t motivated by anti-Muslim bias. All this means that the disaster that was Trump v. Hawaii decision is already having real-world consequences. The conservative justices, especially Roberts, may have consoled themselves about backing Trump by telling themselves that the travel ban was a one-off. It wasn’t. To the contrary, the Supreme Court enabled Trump in the travel ban case by letting him violate basic constitutional values. The Brennan security revocation follows.